This was the second largest volcanic eruption worldwide in the twentieth century. The biggest was Mount Katmai in Alaska in 1912. On June 15, 1991, and persisting for eight hours, the second largest volcanic eruption of the twentieth century, that of Mount Pinatubo, took place on the island of Luzon in the Philippines. The largest eruption was Katmai in Alaska in 1912. Pinatubo is only fifty-five miles from the capital city, Manila. As many as eight hundred people were killed and 100,000 became homeless following the eruption. Millions of tons of sulfur dioxide were discharged into the atmosphere, causing a decrease in the surface temperature of the entire globe over the next few years. Mount Pinatubo is part of a chain of volcanoes along the Luzon arc on the west coast of the main island of the Philippines, Luzon, created by subduction action of tectonic plates similar to the way the volcanic mountains of Cascadia develop, such as Mount St. Helens. 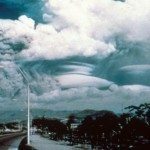 The events of the 1991 eruption began back in July 1990, when a magnitude 7.8 earthquake occurred sixty-two miles northeast of the Pinatubo region, a result of the reawakening of Mount Pinatubo. In mid-March 1991, villagers around Mount Pinatubo began feeling earthquakes and volcanologists began to study the mountain. About 30,000 people lived in villages on the flanks of the volcano prior to the disaster. On April 2, 1991, small explosions from the mountain led to eruptions of ash that was deposited on local villages. The first evacuations of 5,000 people were ordered later that month. Before the catastrophic eruption of 1991, Pinatubo was not a dominant landmark, unknown to most people in the surrounding areas. Its summit was 5,725 feet above sea level, but only about 1,800 feet above nearby plains, and only about six hundred feet higher than surrounding peaks, which largely obscured it from view. An indigenous people, the Aeta, had lived on its slopes and in surrounding areas for several centuries, having fled the lowlands to escape persecution by the Spanish. They were a hunter-gatherer people who were extremely successful in surviving in the dense jungles of the area. The dense jungle that covered most of the mountain and surrounding peaks supported the hunter-gathering Aeta, while on the surrounding low-lying areas the abundant rainfall provided by the monsoon climate and the fertile volcanic soils provided excellent conditions for agriculture. Many people grew rice and other staple foods. Many of the Aeta who lived on the slopes of the volcano left their villages of their own volition when the first explosions began in April, gathering in a village about eight miles from the summit. They moved to increasingly distant villages as the eruptions escalated, some moving as much as nine times in the two months preceding the eruption. Earthquakes and explosions continued to occur. On June 5, a level 3 alert was issued for two weeks due to the possibility of a major eruption. The extrusion of a lava dome on June 7, led to the issuance of a level 5 alert on June 9, indicating an eruption in progress. An evacuation area twelve miles away from the volcano was established and 25,000 people were evacuated. On June 10, Clark Air Base, a U.S. military installation near the volcano, was evacuated. The 18,000 personnel and their families were transported to Subic Bay Naval Station and most were returned to the United States. On June 12, the danger radius was extended to eighteen miles from the volcano and this involved increasing the total numbers evacuated to 58,000. Unfortunately, at the time of the eruption, Tropical Storm Yunya was passing forty-seven miles to the northeast of Mount Pinatubo, causing a large amount of rainfall in the region. The ash that was ejected from the volcano mixed with the water vapor in the air to cause deposits of rock and ash to fall across the whole of the island of Luzon. Many of the eight hundred people who died during the eruption were killed by the weight of the ash collapsing roofs and killing occupants. Had Tropical Storm Yunya not been nearby, the death toll from the volcano would have been much lower. The volcano had experienced major eruptions in the past, the last being about five hundred years ago. Pinatubo stood about 5,725 feet above sea level before the June 1991 eruption. On June 15, the climactic eruption of Mount Pinatubo began in the early afternoon and lasted for nine hours, causing numerous earthquakes due to the collapse of the summit of Mount Pinatubo and the creation of a caldera. The caldera reduced the peak from 5,725 feet to 4,872 feet. In addition to the ash, Mount Pinatubo ejected between fifteen and thirty million tons of sulfur dioxide gas. Sulfur dioxide in the atmosphere mixes with water and oxygen in the atmosphere to become sulfuric acid, which in turn triggers ozone depletion. Over 90 percent of the material released from the volcano was ejected during the nine-hour eruption of June 15. The human impacts of the disaster are staggering. In addition to the up to eight hundred people who lost their lives, there was almost one half of a billion dollars in property and economic damage. The economy of central Luzon was completely disrupted, the volcano having destroyed 4,979 homes and damaged another 70,257. One year after the eruption thousands of additional homes were destroyed and 3,137 were damaged, usually as a result of rain-induced torrents of volcanic debris. The eruption plume of Mount Pinatubo’s various gasses and ash reached high into the atmosphere within two hours of the eruption, reaching an altitude of twenty-one miles and covering an area 250 miles wide. This eruption was the largest disturbance of the stratosphere since the eruption of Krakatau in 1883. It had a Volcanic Explosivity Index (VEI) of 6, making it equivalent to some of the most violent eruptions in all of human history. Mount Vesuvius, Krakatau, and Thera of ancient Greece all had VEI of 6. The aerosol cloud spread around the earth in two weeks and covered the planet within a year. During 1992 and 1993, as a result of this aerosol cloud, the ozone hole over Antarctica reached an unprecedented size, creating a heightened risk of skin cancer all over the world. The cloud over the earth reduced global temperatures. In 1992 and 1993, the average temperature in the Northern Hemisphere was greatly reduced and the entire planet experienced its minimum temperature in August 1992. Overall, the cooling effects of Mount Pinatubo’s eruption were greater than those of the El Nino climatic event that coincided with the aftermath of the eruption. Pinatubo’s cooling effects were also much greater in the years 1992 and 1993 than the increases that were accumulating due to human actions via greenhouse gases. The United States military never returned to Clark Air Base. The damaged base was turned over to the Philippine government on November 26, 1991. In all, the eruption ejected about two and a half cubic miles of material into the atmosphere. Damage to health care facilities, and the spread of illnesses in relocation facilities, led to soaring death rates in the months following the eruption. Education for thousands of children was seriously disrupted by the destruction of schools in the eruption.